Some acts are tougher to follow than others. For every tough-act-followed-with-aplomb like Kasper Schmeichel there’s a Jordi Cruyff. And Audiolab’s M-DAC+ has a long shadow from which to emerge: the original M-DAC has been among our favourite pound-for-pound DACs for half a decade now and has comfortably retained its five-star recommendation throughout. The M-DAC+ has big, Award-winning shoes to fill. The moniker ‘+’ is a confident start – and at first glance it’s easy to see why it’s appropriate. Th Audiolab M-DAC+ is a bigger proposition than its famous forebear in every direction – it’s like a DAC that’s treated itself to a loft extension. It’s probably still just about a viable candidate for the role of ‘desktop’ DAC – as long as your desktop is free of clutter. Apart from the additional bulk, the M-DAC+ doesn’t stray too far from the build-quality and finish template established by the original M-DAC – which can only be a good thing. The M-DAC+ is smoothly and sturdily constructed, impeccably finished and comes complete with a very acceptable remote control – palm-sized but robust and responsive. Aesthetically it’s matched with Audiolab’s recent 8300-series components, with a central OLED display and a pair of rotary knobs for input selection and volume control. As far as perceived value goes, the M-DAC+ looks and feels like every penny of its £800 price ticket. It’s been ‘plussed’ in terms of specification, too. The coaxial and optical digital inputs (there are a pair of each) can handle 24-bit/192kHz hi-res music files, and the USB type-B socket is good for files as hefty as 32-bit/384kHz. There’s a USB type-A connection for Apple products (iPhones from 5 onwards, iPads from theMini 2) and an AES/EBU balanced digital input for those with pro-studio aspirations. Outputs include stereo RCA, naturally, a pair of XLRs, coaxial and optical digital, and a 6.3mm headphone socket. And the M-DAC+ is ready to handle DSD audio too. So while it could just about see service as a desktop device, it’s ready to slot into full systems, big or small. The original M-DAC was a tweaker’s paradise, with no fewer than seven filter settings available. Each made a subtle but definite adjustment to the sound, and effectively rendered the M-DAC a much more bespoke proposition than its nominal rivals. For the M-DAC+ the filter count is up to a giddy eleven, the additional four options applying to DSD audio. One area of specification that remains resolutely unfiddled-with in the M-DAC+ is the DAC chipset itself. The ESS Sabre32 9018 remains extremely well regarded, and is consequently carried over unchanged from the M-DAC. We start by examining the M-DAC+’s filter options. Like the M-DAC, the + has seven distinct filter settings for PCM files and, as with the M-DAC, we find we favour the Optimal TransientXD option – it offers the best balance between timing, organisation and attack. Unlike the M-DAC, however, we also are impressed by the sound via the Minimum Phase setting – it’s a smaller, tighter-knit presentation than Optimal TransientXD but offers a little more attack and dynamism. In any event, we are unable to find a genre or source of music that isn’t best suited to one of these two filter positions. So with the knotty filter issue resolved, we settle in for a long, critical listen. Starting with CD-quality 16-bit/44.1kHz WAV files of Johnny Cash’s One, Boards of Canada’s Aquarius and I Remember A Time When Once You Used To Love Me by Dirty Three, we’re impressed across the board by the Audiolab’s ability to establish a wide and, above all, believable soundstage. It’s an overtly neat and tidy listen – not quite OCD in its fanatical delineation of the soundstage but nevertheless very concerned with making sure it’s as explicit as possible. That’s a trait we wholly admire, and few other comparably priced DACs describe a stage quite as explicitly as the M-DAC+. Even the densest, busiest recordings are laid out openly – in terms of staging, focus and sheer three-dimensionality, the Audiolab dishes out the details like a bar room gossip. It’s equally painstaking when it comes to timbre. The Johnny Cash recording is a pretty simple, sparse affair with a fairly close-mic’d vocal, and the M-DAC+ manages to reveal the fine details and subtle variations in sounds like it was the easiest thing in the world. Timing is good, the interplay and integration between instruments sounding natural and unforced. It’s rhythmically adept too, handling the lazy Boards of Canada beat with ease. It’s a gratifyingly egalitarian device. It doesn’t look down its nose when we switch to a poverty-spec, 256kbps iTunes-derived file of David Axelrod’s London (it grants the tune as much breathing-space as is available and continues to focus well), and neither is it exposed when we move to 24-bit/192kHz files of Elvis Costello & The Attractions’ Man Out Of Time. The more information-rich the file, the more information the Audiolab M-DAC+ hands over, combining authority with fluent musicality in a way that encourages further listening. It’s a similarly confident, authoritative performer when listening via the headphone socket. This Audiolab’s talent for staging, focus and detail retrieval is even more apparent when using an appropriately capable pair of headphones. Nothing’s perfect though, obviously, and the M-DAC+ is no exception. For all its powers of organisation, rhythmic assurance and unflustered attention to detail, we would ideally like just a touch more drive and attack when recordings really demand it. It describes the shift from ‘very quiet’ to ‘very loud’ in a recording like The White Stripes’ Ball And Biscuit in a detailed and agile manner, but the last scintilla of the aggression the tune thrives on is fractionally underplayed. We find we wonder how the M-DAC+ would handle itself in a mosh-pit. Ultimately, though, that’s nit-picking. Everything the M-DAC+ does well – and it does an awful lot well – it does really very well indeed. 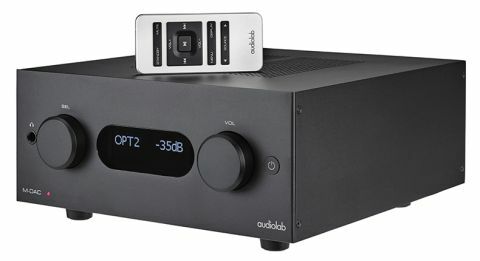 The Audiolab M-DAC+ gets an awful lot right – so much, in fact, it comfortably justifies its ‘+’ designation. Lavishly detailed, fastidiously organised and elegantly straight-edged in its sound, it absolutely demands an audition.